Photo by Stefan Andrej Shambora via Flickr. Museums—particularly smaller ones—have long been seen as cornerstones of their community. A good museum may host community events, stage locally-focused exhibitions, serve as keepers of a community’s history, sponsor essential outreach initiatives, act as a second classroom for local school children, or maintain an advisory board of important community members. While all of these great actions are worthy of recognition, the following series will focus on another symbiotic feature between museums and the communities they serve: tourism. More often than not, when someone visits a museum, they are also paying a visit to the neighborhood that the museum lives in. Therefore, with “Better Know a Museum Neighborhood” we will try to shed a light on what’s going on around museums so that on your next museum visit you can truly make a day of it. Guest Post: Hope for the American Folk Art Museum? Photo by S. Diddy via Flickr. 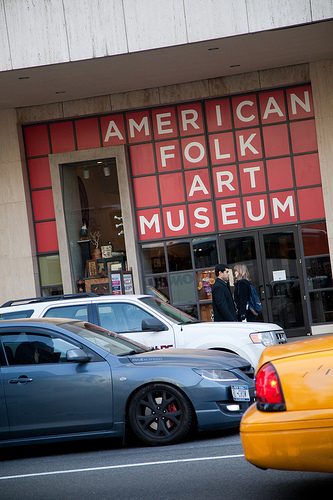 The American Folk Art Museum originally opened in 1963 in a rented floor of a townhouse at 49 W. 53rd Street. Nearly 40 years later, after calling several other spots home, the museum would settle just a few doors down from its birth place, at 45 W. 53rd. This move would set off 10 fraught years of declining admissions and reluctant donations before culminating in a stand-off with one of the ‘Big Five’ museums over its own fate. While ambitious, the new building—designed by architecture duo Tod Williams and Billie Tsein—has attracted varied opinions since it opened in December of 2001. Many complained the seemingly ample 30,000 square feet were laid out too vertically, and that the space was confusing, full of narrow halls and stairwells, with galleries too small to adequately display art. A single skylight on the top floor allowed for light through each of the floors. The rooms were cramped, some said. Others claimed it allowed for a more intimate experience with the art, in direct contrast to the stark, large rooms common in most museums. The space allowed for 500 of the some 5,000 objects in its collection to be displayed. And then there was the façade, a striking and angular 85-foot-high bronze arrangement that seemed better suited for a corporate office building, a long slit up the middle of the Tombasil—a white bronze alloy which required assembly in a foundry, and that when poured directly onto concrete caused “tiny explosions”—but curiously lacking any signage. The building was interesting and certainly even beautiful, winning Williams and Tsein multiple awards, including the 2003 New York City American Institute of Architects Design Award, and the 2001 Municipal Art Society Masterwork Award; it just wasn’t an effective art museum. 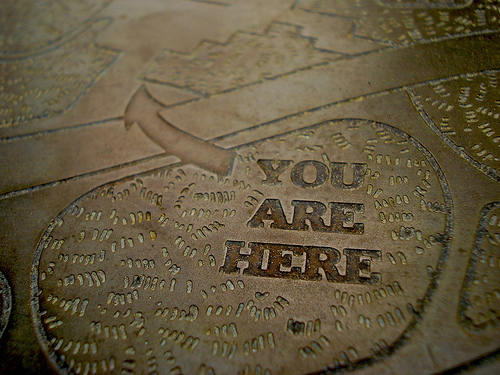 Photo by Lauren Manning via Flickr. Its proximity to the Museum of Modern Art—the buildings sit next to one another—was initially expected to produce an increased level of attendance. In fact, before opening, there were estimates the museum at its new site would attract upwards of 250,00 visitors a year within four years; by 2011 it was averaging just 160,000. No small sum, but still far from what was needed to keep the museum solvent. 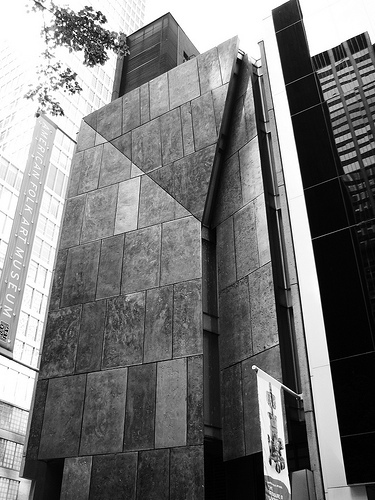 During renovations to MoMA between 2002 and 2004, most of West 53rd street was closed off, limiting attendance to the American Folk Art Museum. Meanwhile, the museum stopped publishing Folk Art Magazine, cut its staff from 50 to 12, and shrunk its budget to just $7 million, down from $10 million in 2009. Then came the recession, when generous donations to cultural institutions were not exactly a priority. Further personnel issues arose when AFAM’s contemporary curator, Brooke Davis Anderson, left in 2010 to become the Deputy Director of Curatorial Planning at the Los Angeles County Museum of Art. Then, in 2011, the museum’s former chairman and board president from 1977 and 1999, Ralph O. Esmerian, was found guilty of fraud and sentenced to six years in jail. Though he had originally promised his personal collection of folk art to the museum, in 2008 his most famous piece—a version of Edward Hicks’s painting “A Peaceable Kingdom”—was sold at auction; Esmerian had used the painting as collateral against a debt he owed. In 2000, the museum had raised $6 million to help finance the new building; after 10 years and a $4 million deficit, it brought in a little over half that amount. Defaulting on the $32 million loan owed to the city’s Trust for Cultural Resources two years prior, the museum closed its doors in July of 2011 and moved operations back to the lobby space opposite Lincoln Center, a space just one sixth the size of its home on West 53rd. There were talks of absorbing the collection into the Smithsonian Institution and having part of the collection displayed at the Brooklyn Museum. AMAF’s senior curator, Stacy C. Hollander, has said, “Neither [institution] would fulfill the function of a stand-alone folk art museum.” Regardless, the dissolution of the collection in its current state would require dual approval from both the New York State attorney general’s office and the State Department of Education. Following the AFAM’s closure in 2011, New York Magazine writer Jerry Saltz wrote almost clairvoyantly, “Really, [they] should just sell its building to MoMA. MoMA could then either tear it down and build something new, or transform it into offices.” And that’s precisely what happened. Although the building might have had its critics, there was no shortage of backlash following MoMA’s announcement of its plans to raze the Folk Art Museum in April. Where would the art go? How would it fit into the greater catalog of MoMAs existing collections? Why would one museum want to demolish another? An outsider establishment, sure. But a fellow museum? Photo by Bruce Berrien via Flickr. 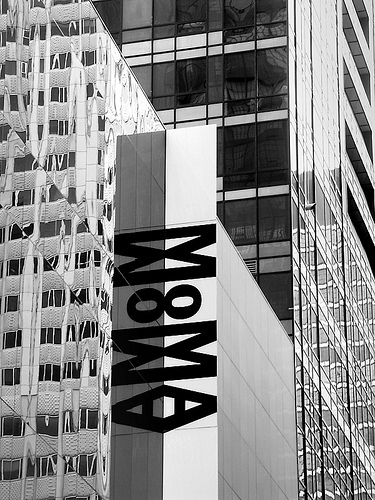 In May of this year, MoMA backed off—at least for now. Many expect MoMA to move forward with a plan to expand and incorporate either some or all of the original building, much the same way the Met did with its American Wing, by building around it and connecting an open side of the AMAF to the existing floors of MoMA. But, construction headaches such as the floors not matching up correctly, and the bleak interior of the AMAF could deter the ‘museum within a museum’ concept. With the bulldozers on hold for the time being, MoMA has hired New York design studio Diller Scofidio + Renfro to help find a path forward. Last week, the American Folk Art Museum received a $1.6 million grant from the Henry Luce Foundation, for a traveling exhibition across five cities in the U.S. over three years beginning with New York in 2014. The exhibit, titled “Self-Taught Genius: Treasures from the American Folk Art Museum” will include paintings, quilts, and other pieces from the museum’s masterworks collection. There’s hope for the Folk Art Museum yet. Erin Wurzel is a writer and photographer living in Philadelphia, with dreams of picking up and moving to Paris. She has a B.A. in Journalism from Temple University. She loves Impressionism, gin cocktails, and the city of Brotherly Love. You can find her blogging about almost everything at like / want / need.